This Demonstration explores Young's interference experiment, to show a continuous transition between classical behavior and "quantum motion," as represented by Bohm trajectories in - space. In chemistry and solid-state physics, the scale intermediate between microscopic and macroscopic is called mesoscopic or semi-classical. In the classical case, the trajectories become straight lines crossing the axis of symmetry, in uniform, unaccelerated motion. In the quantum-mechanical limit, the trajectories tend toward the local maxima of the squared wavefunction. These correlate with the plateaus of the quantum potential, and therefore correspond to the bright fringes of the diffraction pattern. The fate of a particle depends sensitively on its initial position. A quantum particle passes through slit 1 or slit 2, but never crosses the axis of symmetry. 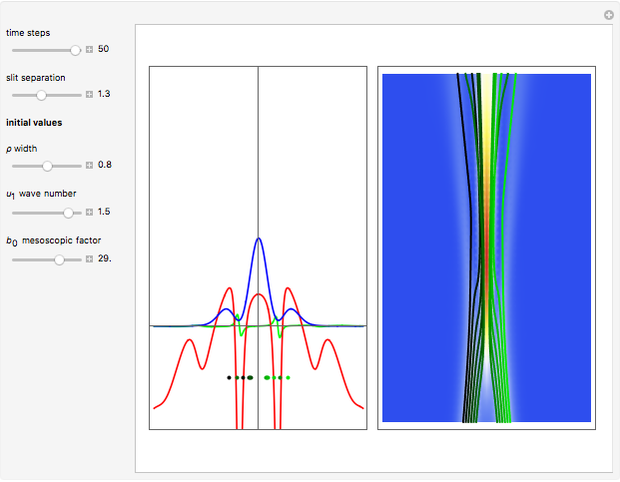 The graphic on the right shows the squared quantum wavefunction and the Bohm trajectories. The graphic on the left shows the position of the particles, the squared quantum wavefunction (blue), the quantum potential (red) and the acceleration (green). The acceleration and quantum potential are scaled to fit. Quantum particles are emitted by a source , pass through two slits in a barrier and arrive at a screen. For simplicity, two identical Gaussian profiles are assumed with identical initial width and group velocity in - space, and the classical initial velocities are restricted to the initial velocities of the Bohmian trajectories. 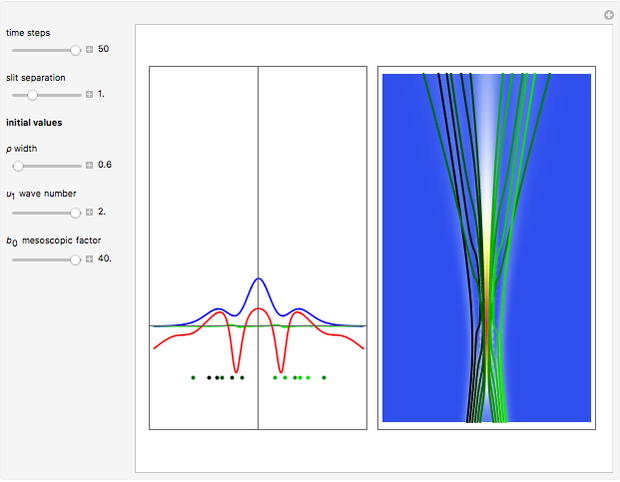 The group velocities of the Gaussian profiles differ only in sign. For simplicity, we set the mass of the particle , as well as , equal to 1. For , the trajectories become classical because reduces to 0. For , the trajectories become Bohmian because tends to 1, the quantum limit, which leads to the quantum motion. For increasing time, the amplitude of the quantum potential decreases. For more detailed information about the continuous transition between the classical and the Bohm trajectories, see [1–3] and for an animated example, see . If you increase PlotPoints, AccuracyGoal, PrecisionGoal and MaxSteps, the results become more accurate. The starting positions of the particles are linearly distributed around the peaks of the wave density at . The particle positions are plotted against their downscaled kinetic energy along the vertical axis. For certain time steps and for certain environment factors (mesoscopic cases), the trajectories become very unstable. The trajectories for the double slit were first numerically calculated in . For more detailed information about Bohmian mechanics, see . P. Ghose, "A Continuous Transition between Quantum and Classical Mechanics. I," Foundations of Physics, 32(6), 2002 pp. 871–892. doi:10.1023/A:1016055128428. P. Ghose and M. K. Samal, "A Continuous Transition between Quantum and Classical Mechanics. II," Foundations of Physics, 32(6), 2002 pp. 893–906. doi:10.1023/A:1016007212498. P. Ghose and K. von Bloh, "Continuous Transitions between Quantum and Classical Motions." arxiv.org/abs/1608.07963. P. Ghose and K. von Bloh. Continuous Transitions between Quantum and Classical Motions for Young's Interference Experiment [Video]. (Sep 28, 2016) www.youtube.com/watch?v=m_IHnJFSk0U. C. Philippidis, C. Dewdney and B. J. Hiley, "Quantum Interference and the Quantum Potential," Il Nuovo Cimento B, 52(1), 1979 pp. 15–28. doi:10.1007/BF02743566. S. Goldstein. "Bohmian Mechanics." The Stanford Encyclopedia of Philosophy. (Sep 25, 2016)plato.stanford.edu/entries/qm-bohm. Partha Ghose and Klaus von Bloh "Continuous Transition between Classical and Bohm Quantum Pictures for Young's Interference Experiment"